Art & Beyond Magazine is a bridge between the artists and the art world. It is an essential marketing and promotional tool every artist needs to possess when exhibiting their work, whether at art shows, art expos, or small exhibitions. 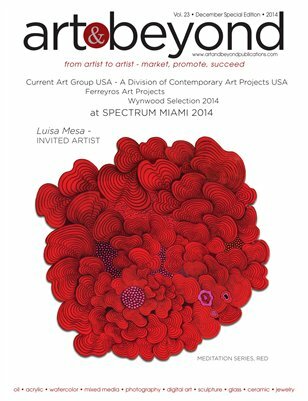 This Art & Beyond Online issue is a Special Edition and serves as the catalog for Current Art Group USA— Art Projects a Division of Contemporary Art Projects USA based in Miami, FL will present its 2014 Art Basel Week Spectrum - Miami Project in which it will showcase emerging and invited established international artists at its 700 square feet booth #315 under the direction and marketing expertise of Tata Fernandez, Executive Director.